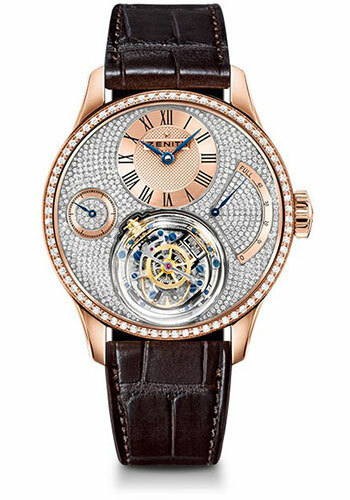 45mm rose gold case, 14.35mm / 21.40mm thick, transparent sapphire glass back with gold counterpoise of the gyroscopic system, rose gold bezel set with diamonds, domed sapphire glass crystal with anti-reflection treatment on both sides and domes protecting the christophe colomb module, dial entirely set with diamonds, hour markers black lacquered, hands blued steel, el primero 8804 manual movement with hours and minutes excentred at 12 o'clock, self-regulating gravity control module at 6 o'clock, small seconds display at 9 o'clock, power-reserve indicator at 3 o'clock, approximately 50 hours of power reserve, brown alligator leather strap with protective rubber lining, triple folding clasp buckle. Water resistant to 3 atm. 45mm platinum case, gold guilloché and white lacquered dial, manual winding El Primero 8804 movement with hours and minutes, small second, chronograph, date, tourbillon, approximately 50 hours of power reserve, black alligator leather strap with triple-folding gold buckle. Water resistant to 3 ATM. 45mm platinum case, 14.35mm / 21.40mm thick, transparent sapphire glass back with gold counterpoise of the gyroscopic system, platinum bezel, domed sapphire glass crystal with anti-reflection treatment on both sides and domes protecting the christophe colomb module, sapphires dial with hour markers black lacquered, hands blued steel, el primero 8804 s manual movement with hours and minutes excentred at 12 o'clock, self-regulating gravity control module at 6 o'clock, small seconds display at 9 o'clock, power-reserve indicator at 3 o'clock, approximately 50 hours of power reserve, black alligator leather strap with protective rubber lining, triple folding clasp buckle. Water resistant to 3 atm. 45mm 18K white gold case, transparent sapphire glass back, diamond bezel, full set diamond 18K white gold dial with dome cover over Zero-Gravity module, manual winding El Primero 8804 movement with hours and minutes excentered at 12 o'clock, small second at 9 o'clock, self-regulating Zero-Gravity module at 6 o'clock, and power reserve indicator at 3 o'clock, approximately 50 hours of power reserve, black alligator leather strap with triple-folding gold buckle. Water resistant to 3 ATM.